This page is for people enrolled in my UWA 3-day workshop. The additional slides on forecastHybrid, opera and prophet were part of this talk given in Eindhoven in April 2017. Use these to record your answers to all lab session exercises. Use Retail.Rmd for all questions involving the retail data introduced in the first lab session, and the other file for the remaining exercises. Read the data into R and choose one of the series. This time series will be used throughout the short course in lab sessions. Explore your chosen retail time series using these functions. Can you spot any seasonality, cyclicity and trend? What do you learn about the series? Use the help files to find out what the series are. Calculate the residuals from a seasonal naïve forecast applied to quarterly Australian beer production from 1992. Test if the residuals are white noise. Check that your data have been split appropriately by producing the following plot. 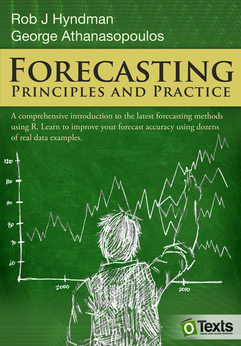 Calculate forecasts using snaive applied to x1. Compare the accuracy of your forecasts against the actual values stored in x2. Do the residuals appear to be uncorrelated and normally distributed? How sensitive are the accuracy measures to the training/test split? We will use the bricksq data for this exercise. Compute and plot the seasonally adjusted data. Use a naïve method to produce forecasts of the seasonally adjusted data. Reseasonalize the results to give forecasts on the original scale. Do the residuals look uncorrelated? Repeat with a robust STL decomposition. Does it make much difference? For this exercise, use the price of a dozen eggs in the United States from 1900–1993 (data set eggs). Use SES and Holt’s method (with and without damping) to forecast “future” data. Which method gives the best training RMSE? Are these RMSE values comparable? Do the residuals from the best fitting method look like white noise? Now we will apply Holt-Winters’ multiplicative method to your retail time series data. Why is multiplicative seasonality necessary here? Experiment with making the trend damped. Compare the RMSE of the one-step forecasts from the two methods. Which do you prefer? Check that the residuals from the best method look like white noise. Now use the same training/test split you did in Lab Session 4 to test your Holt-Winters’ forecasts on the retail data. Can you beat the seasonal naïve approach from Lab Session 4? How does this model compare to the Holt-Winters’ method you applied in the previous lab session? What do the smoothing parameters tell you about the trend and seasonality? Does it always give good forecasts? Find an example where it does not work well. Can you figure out why? For the following series, find an appropriate Box-Cox transformation in order to stabilize the variance. Why is a Box-Cox transformation unhelpful for the cangas data? What Box-Cox transformation would you select for your retail data? For the same retail data, try an STL decomposition applied to the Box-Cox transformed series, followed by ETS on the seasonally adjusted data. How does that compare with your best previous forecasts on the test set? For the following series, find an appropriate differencing (after transformation if necessary) to obtain stationary data. For your retail data, find the appropriate order of differencing (after transformation if necessary) to obtain stationary data. Select a time series from wmurders, usgdp and mcopper. produce forecasts of your fitted model. Do the forecasts look reasonable? compare the results with what you would obtain using ets() (with no transformation). For your retail time series, develop an appropriate seasonal ARIMA model, and compare the forecasts with those you obtained earlier. Do the data need transforming? If so, find a suitable transformation. Are the data stationary? If not, find an appropriate differencing which yields stationary data. Identify a couple of ARIMA models that might be useful in describing the time series. Which of your models is the best according to their AIC values? Estimate the parameters of your best model and do diagnostic testing on the residuals. Do the residuals resemble white noise? If not, try to find another ARIMA model which fits better. Forecast the next 24 months of data using your preferred model. Compare the forecasts obtained using ets(). For this exercise, we will continue to use your retail data. Use ets to find the best model for these data and record the training set RMSE. We will now check how much larger the one-step RMSE is on out-of-sample data using time series cross-validation. The following code will compute the result, beginning with four years of data in the training set. Replace ??? with the appropriate values for your ETS model. Plot e using ggtsdisplay. Do they look uncorrelated and homoscedastic? How do the RMSE values compare? Does the re-selection of a model at each step make much difference? Check the residuals of the fitted model. Does the residual series look like white noise? Compare the forecasts with those you obtained earlier using alternative models. We will reconcile the forecasts for the infant deaths data. The following code can be used. Check that you understand what each step is doing. How would you measure overall forecast accuracy across the whole collection of time series? Repeat the training/test set analysis using “bottom-up” forecasts (set method="bu" in the forecast function). Does the ``optimal’’ reconciliation method work best here? Use thief() on your retail data, using ARIMA models for each aggregation. Does the temporal reconciliation lead to improved forecasts on your test set? Use the tbats function to model your retail time series. Check the residuals and produce forecasts. Does this completely automated approach work for these data? Have you saved any degrees of freedom by using Fourier terms rather than seasonal differencing? Consider the US finished motor gasoline products supplied (thousands of barrels per day) in the gasoline data set. Fit a tbats model to these data. Could you model these data using any of the other methods we have considered in this course? Experiment with using nnetar() on your retail data and other data we have considered in previous lab sessions. Over this short-course, you have developed several models for your Australian retail data. The last exercise is to use cross-validation to objectively compare the models you have developed. Compute cross-validated RMSE values for each of the time series models you have considered. It will take some time to run, so perhaps leave it running overnight and check the results tomorrow.